I had to try this place after my dad told me that there was free flow of Nasi Lemak rice and he said it was “not bad”. 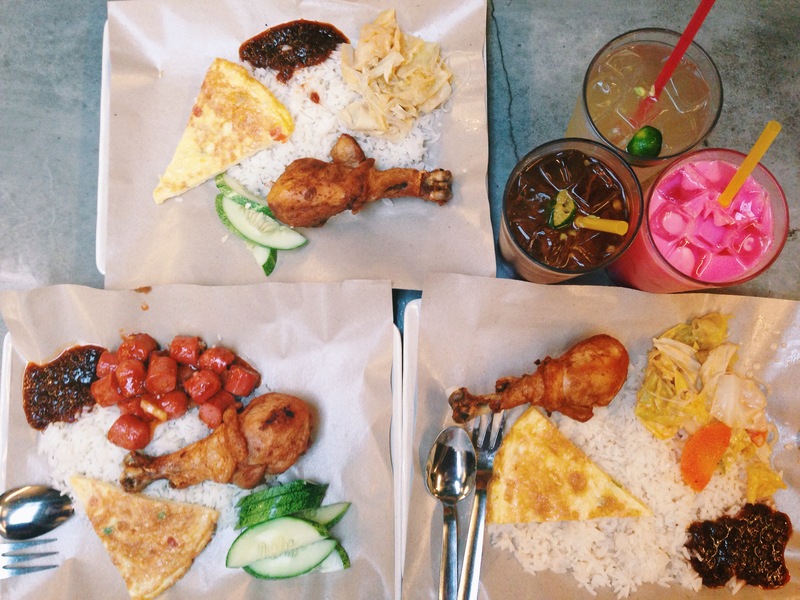 This shop sells Nasi Lemak with a unique concept. It is owned by a Chinese who employs Malays. The interior design of the shop is so hipster that you won’t even believe that it sells the traditional dish of Nasi Lemak. There is the cemented floor, the nonexistent ceiling where you can see the pipes running all over and the metal scaffolding, the random quotes everywhere and the pop music. For the food, customers scoop their rice and whatever ingredients they want, then pay for it at the counter. The shop gets brownie points for being different but sometimes different isn’t that great after all. I got confused as to how much ingredients to scoop onto my plate because they charge per scoop which leads to the question of “how big is one scoop?!”. It got quite annoying that I didn’t know how much each dish cost because the dish wasn’t individually labeled with prices, they were written on this board which was hard to refer to. Basically, you just scoop with hesitation and pray hard you didn’t burn a hole in your pocket when you reach the cashier. I ordered a deep fried chicken thigh, an omelette, sayer lodeh and a lime juice. The chicken thigh was too dry while the omelette was too thin. If you prefer a more coconut milk based sayer lodeh, you would love their sayer lodeh. It works for people who can’t take spiciness as well. The serving is too small for $1 and it left me wanting for more ): The lime juice was freshly squeezed and in Claudia’s opinion, it has fulfilled the most important criteria of a good fruit juice. The rice was a standout from the mediocre fare. This rice is not like ordinary Nasi Lemak rice, it is steamed over water instead of being cooked in a rice cooker. This means that the coconut milk is not overcooked and the rice is cooked to perfection- flavourful with bite. I might go back again just for the $1 free flow rice but the side dishes aren’t that fantastic or cheap. I dislike how dubious their pricing system is.